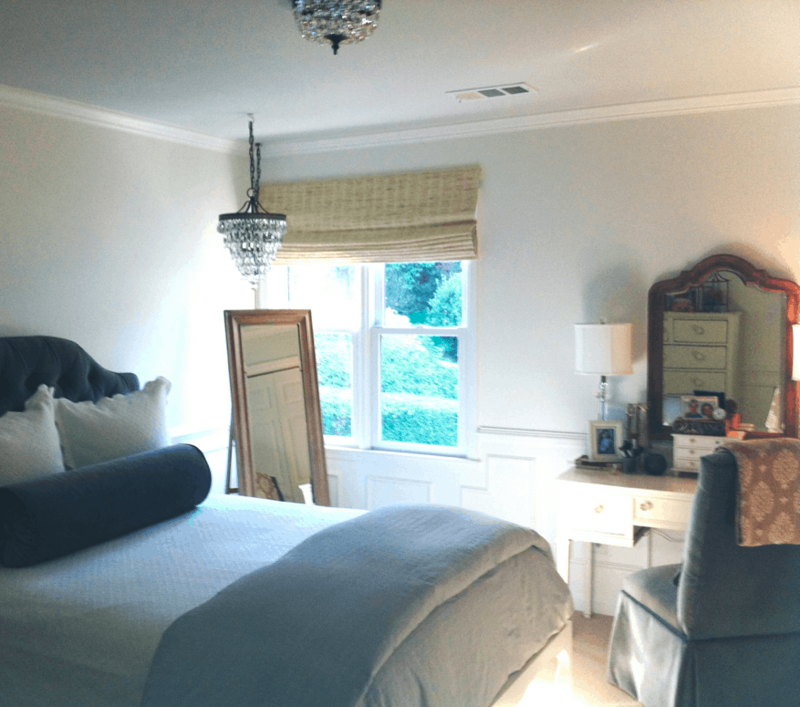 e-designed bedroom in Atlanta. It was based on a French, tone on tone theme. Ballard Design and a custom bolster. 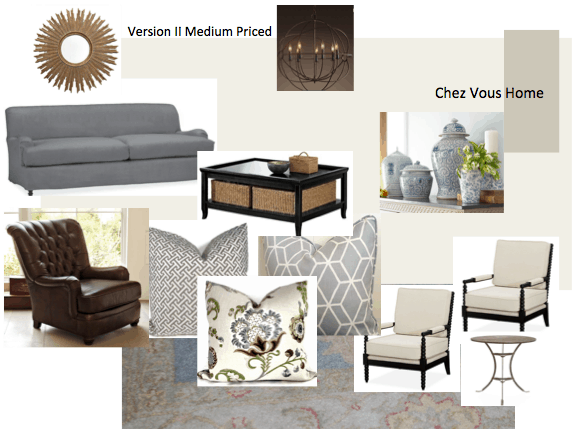 Plan by Chez Vous Home including sources and floor plan. 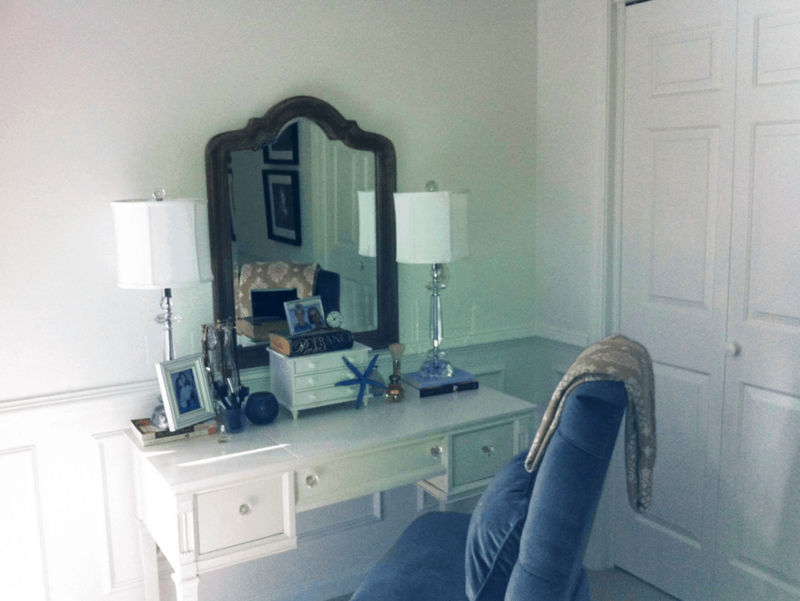 The former desk is now a young lady’s vanity. We were able to use her crystal lamps. I like to incorporate existing furnishings, as much as possible. 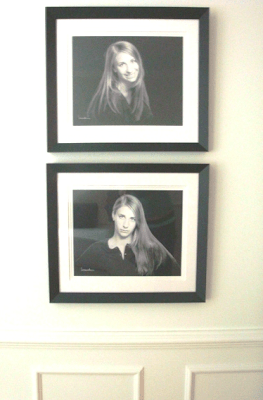 Thank you, Karen, for taking these photos! Also in Atlanta, I just finished an e-design for family with young children. I included a second slipcovered option. 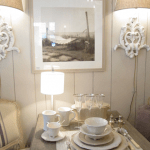 wood wainscoting and shelving to lighten the space…got to convince the husband! That’s why we are softening him up with his own leather chair! I also recommend installing the television in the bookcase and away from entrance to the room. Included is a floor plan and sources. I truly feel like she is a new friend. I hope I get to meet her in person one day. Can you tell that the ceiling was painted a soft blue gray? Would you benefit from an e-design? OH I WANT THIS BED!! Beautiful Mary Ann!!! 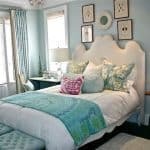 I saw this same headboard in a gorgeous store here!! This room is dreamy! The room came out beautifully and I want that headboard! That headboard is exactly what I've been looking for, it's stunning. You did a wonderful job long distance. The room is amazing. I love the tufted headboard form Ballard. Just perfect. You are one busy designer! Your work is beautiful. 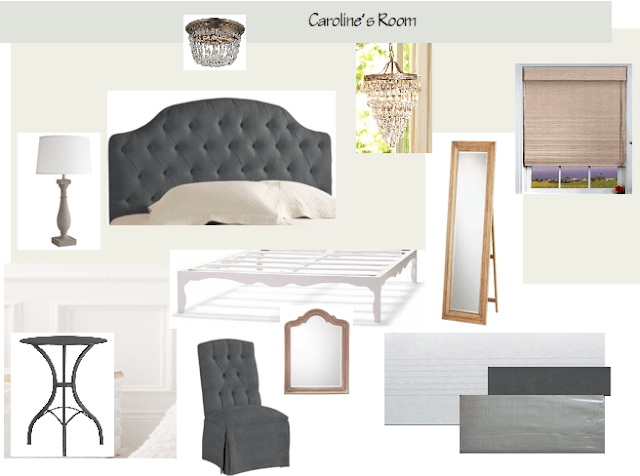 Mary Ann, We are all loving your choice of headboard from Ballard. It is just luscious as well as the scalloped bedding! They look great! I love gray and white- I never tire of that color combo! I always enjoy seeing your boards! What a lovely, elegant space! 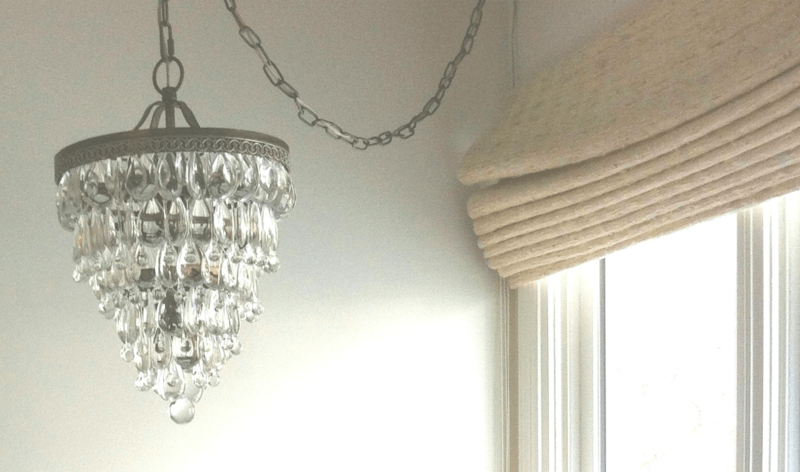 I adore the chandelier over the floor mirror – a gorgeous touch! 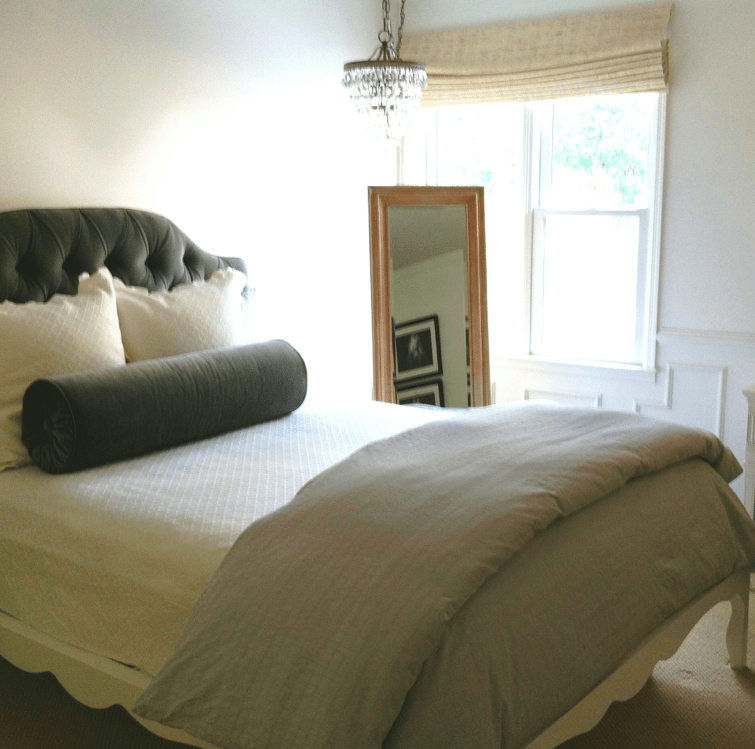 Love the before and after of the bedroom…its so sophisticated and beautiful with a lovely French vibe. And the living room boards- gorgeous! Cannot wait to see it all come to life! It's beautiful and a room that she'll enjoy for a long time. I love that first shot where you see the headboard, bolster, bedding – it's beautiful. 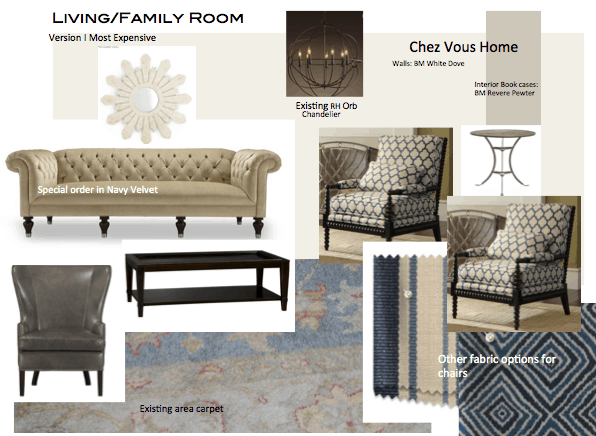 And I love the second design board that you put together for the living room. I saw a TV built into a shelf yesterday on Houzz and thought that was a great option. It was still in plain view but it wasn't the main focal point of the room. Love the color on the headboard and bolster! So fun to see a board come to life. Beautiful work, Mary Ann! I love the prints you chose for the living room. 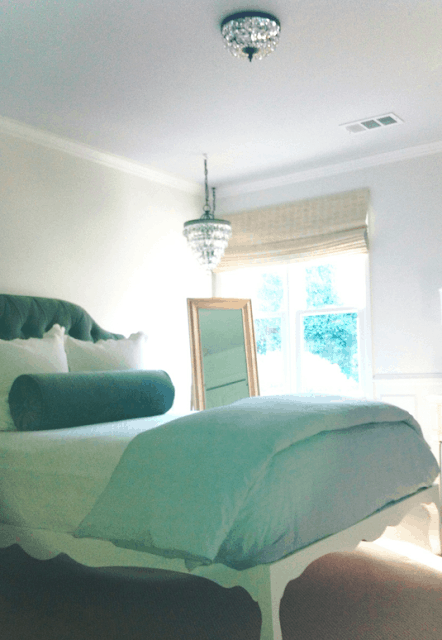 And, the bedroom is classic, such pretty soft colors. Mary Ann…this room shines now!!! Love how soft it is…..I know she is thrilled! Amazing transformation! Soft and dreamy. I love the other idea boards too. You are so talented. Very nice, Mary Ann. Love the bed and the sophisticated color palette. That decor will last for years. Would love to know what program you used to do your concept boards. Lovely, lovely, lovely!! The velvet is fabulous! Love, love, love it Mary Ann! I have tried several times to contact you regarding your e-design services and my emails are always sent back to me "undeliverable". How can I get in touch with you, I'm very interested in your services? 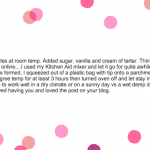 Gail: did you try madamepickett@gmail.com? Should work. I will look for your email. 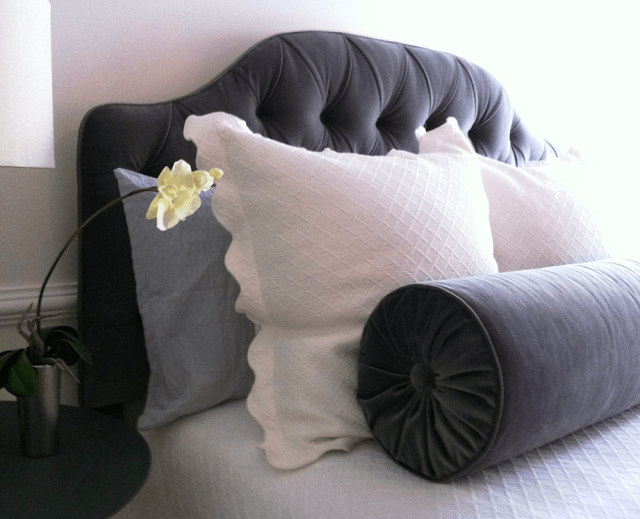 beautiful job–that bolster in velvet looks so luxurious! That truly is a STUNNING room! You did such a good job and the next project sounds/looks incredible too. 🙂 Thanks so much for your sweet comment today over at our place! Very pretty. You can never go wrong with a tufted headboard. Such a classic look! E-Design is the neatest thing. Thanks for sharing! You are so talented! Love the bed! That bedroom is really great. The velvet is so inviting. I love fabric you want to touch and snuggle up against, especially on a bed. So, so nice. I laughed at the bribe of the leather chair in return for painted woodwork — a battle I have yet to win after 18 years. I hope she gets her way!! The two versions of the room are wonderful to compare, and I think they are equally beautiful. Hi, I'm Karen, Mary Ann's client. I can't tell you how much my daughter Caroline loves her room. I told Mary Ann that my friends have asked "do you sleep in there when your husband travels?" (Caroline is away at college). No, I haven't done that, but I do hope to have Mary Ann create a design for my master bedroom. I wish she could do my entire house, too! I am so thrilled that I've gotten to know Mary Ann and can't wait to meet her in person. This has been so much fun! You are so great, Karen. Wow! What an incredible transformation! 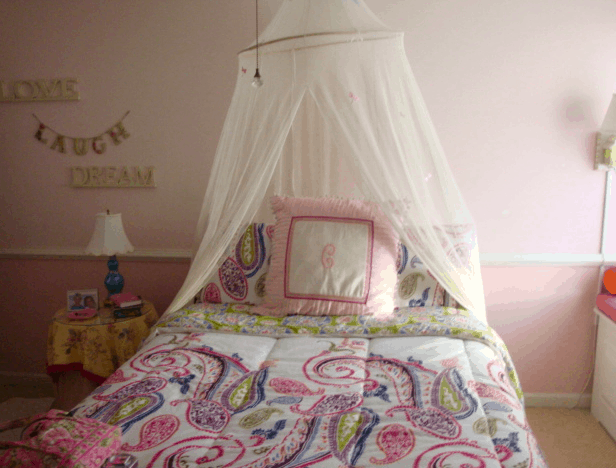 You & Karen really brought her daughter's bedroom into adulthood. Love the quiet sophistication of the room! Thanks for sharing. I'm wondering where the bed frame came from…I couldn't link over to Chez Vous Home. I've never seen one like it. Mary Ann, my heart skipped a beat at the sight of this room! Beautiful!